With development pressure coming up from Center City and down from Temple, North Broad Street has made some incredible strides in the last decade. 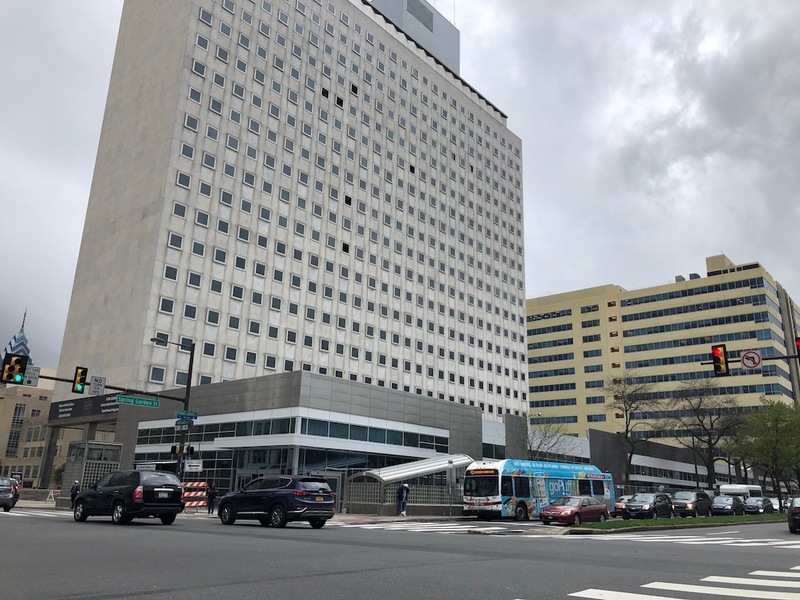 Two of the most prominent shifts on this corridor have occurred at the Broad & Spring Garden intersection, with Tower’s conversion of the Pennsylvania State Office Building into apartments and EBRM’s reuse of the former Thaddeus Stevens school for the same purpose. This additional density, combined with new residents from other projects nearby, has created additional demand for retail in the area. In an effort to address this vacuum, Tower has been building a one-story shopping center on the southwest corner which will house a handful of utilitarian if unexciting businesses like a Starbucks, a CVS, and a Citizens Bank. 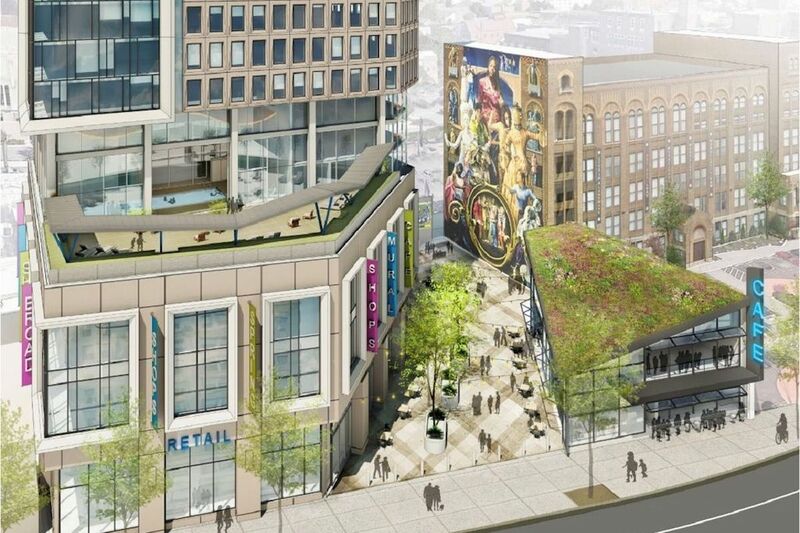 We complained about the project previously, wondering whether a small shopping center was really the highest and best use at a hard corner of Broad & Spring Garden. Perhaps independently or maybe gaining some inspiration from the project across the street, EBRM had similar plans on the northeast corner, on a lot next to Mural Lofts. We were able to wrap our heads around a short building in front of the State Office Building, with an eye toward protecting the building’s northern sunlight. Building a small building next to Mural Lofts never seemed to make sense, since the western wall of the building has no windows. That being said, one would think that any project on the property would seek to preserve the Common Threads mural on the side of the building. Thanks to the “qualified opportunity zone” provision in the 2017 tax cuts, investors in projects in opportunity zones are able to defer and save on capital gains taxes. The northeast corner of Broad & Spring Garden is located in such a zone, which likely explains why the plans have changed dramatically for the site. Instead of a low rise shopping center, EBRM is now planning a thirty-story mixed-use building which will strike an impressive presence at this intersection. The building, per Philly.com, will include over 200 apartments, 68K sqft of office space, a gym that sprawls over six stories, and 10K sqft of retail space that’s not yet leased. 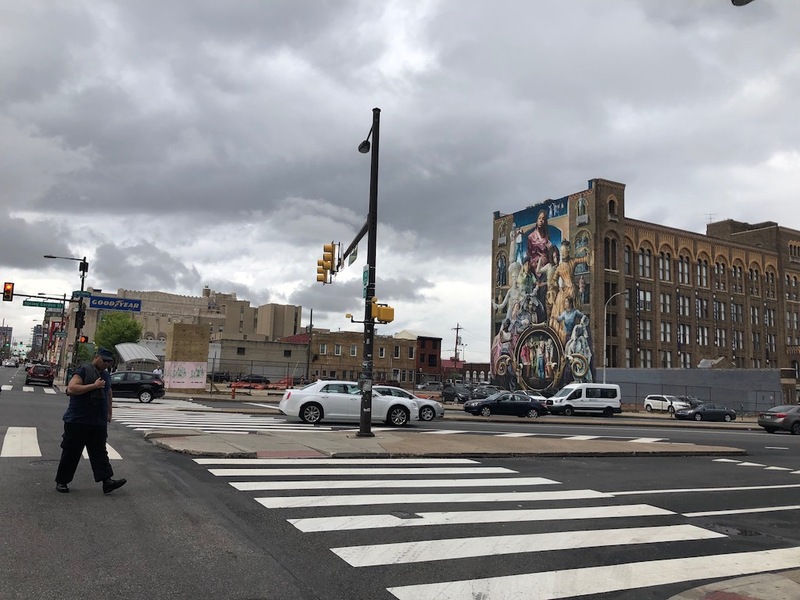 Looking at the renderings from the Philly.com story, we’re pleased to see that the project will preserve sight lines of the mural, though it’ll be much tougher to see than it is today. Nevertheless, a building like the one designed by AOS Architects will be a tremendous step up for the intersection. Over two years ago, we told you that Parkway was planning a pair of buildings for the northwest corner of Broad & Spring Garden, a project that would rival this one in terms of impact to the area. While it’s possible and even likely that this project will eventually move forward, groundbreaking hasn’t occurred as of yet. The project next to Mural Lofts is looking to break ground in July, just a few months from now- the sooner it gets started, the more quickly the investors are able to take advantage of the opportunity zone tax benefits. The northwest corner is also in an opportunity zone, so perhaps we’ll finally see some movement over there in the near future. 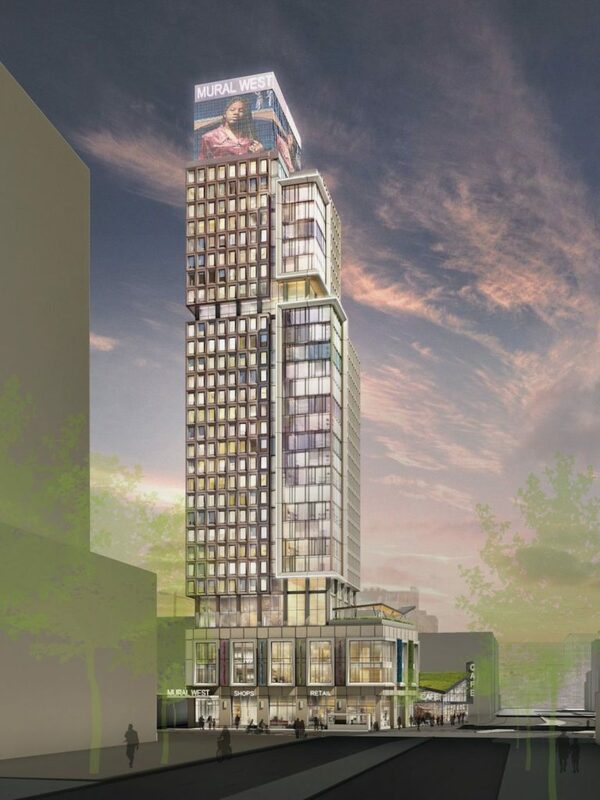 Could we please stop with the myth that this tower is happening because of the opportunity zone, or any tax break? Similar, and often larger, projects are happening in almost every direction in that part of the city without using the opportunity zone tax break. Most of these projects are under construction already, or recently finished. That includes the completed Hanover North Broad apartments to the south with 339 upscale units, the completed 32-story tall Alexander tower a couple blocks away with more than 300 luxury units, the Hamilton apartment complex a block away with eventually 550 units; but phase one is already complete, the large Independence Press Building to the east currently under renovation into apartments, the renovated Divine Lorraine to the north with 102 apartment units, and next to the Divine Lorraine the huge 1300 Fairmount apartment building is under construction and will have 485 apartment units, as well as, the former state office building renovated into luxury apartments a few years ago at the same intersection. And now there is the completed Rail Park, which probably has more to do with this tower being built than any tax break program. Bravo! Great news that this site will get (what appears to be, at this point) a somewhat interesting, well designed tower, as CC moves north, up Broad St. This is a city, after all, and low-rise, cheap, suburban style projects are a waste of valuable space. Moving upward it the best way to improve Philadelphia. If you really want low-rise, there’s already plenty of it, but center city isn’t the place for it. Sorry…. I was stunned when I was told a few years ago that they wanted to put a strip center with a wawa and a bank and parking. This is great news. Also can not wait till they develop big empty lot across the street. Please clarify which shopping center is being canned – the one on State Office Building or the other proposed for construction?